WEL.WTHA1 hot air soldering station. The WT line of the WELLER soldering stations includes modern soldering devices manufactured using the microprocessor technology. They guarantee excellent stability and temperature accuracy with high heat efficiency. Thanks to a large, clear LCD display, users can view all station parameters in the form of a bargraph or in a digital format. manufactured with the use of ESD-safe technology. The WEL.WT1 / WEL.WT1H soldering stations are also available as a part of soldering kits with accessories for soldering (station, soldering iron, and base). The Weller WEL.WTP90 soldering iron was designed for working with the new WT line of Weller soldering stations. The increased heating power of 90W ensures even faster heating of the tip and improves heating efficiency, which is especially important when soldering large electronic components. In addition, the soldering iron is compatible with the new WEL.THM tips designed for soldering components of very high thermal capacity. 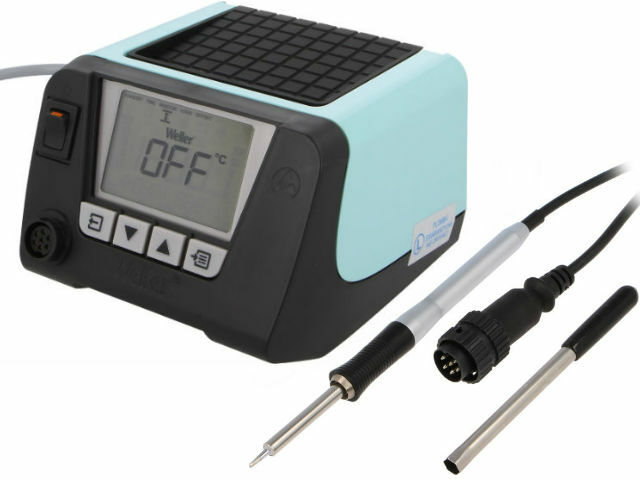 The WEL.WTHA1 hot air soldering station from Weller is a tool for repairing, creating prototypes, and manufacturing electronic equipment. Due to high power and strong, adjustable air flow, the WEL.WTHA1 station can be used for soldering components with high thermal capacity, including surface-mount BGA packages. Furthermore, the station was manufactured with the use of ESD-safe technology, and it allows using both leaded and lead-free solder. The WEL.WTHA1 station is complaint with the new series of hot air pencils: with straight nozzles (WEL.TNR) with the diameters of 2.5mm, 4mm, or 7mm, and angular (WEL.TNRB) with the diameters of 1.7mm or 6mm, and the angle of 45°. the hot air pencil can be mounted on the left or right side.